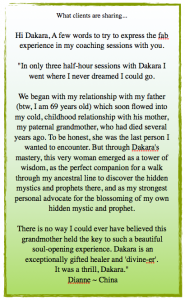 DaKara is an Alchemist of the light! You need to transform Your life! Light Alchemist for the Golden Age! and serve more clients from that capacity? passions that dwell deep within your heart! Relinquish limiting beliefs and old aberrant patterns. In the relinquishing we create space to receive! Ready to RELEASE the pain of the past? Relinquish the pain in your body? The heartache that holds you back? “Clearing from your Heart Center! Dakara is amazing. She is exceptionally gifted and good at what she does.